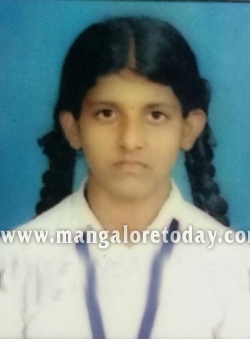 Mangaluru, Dec 8, 2015 : A 17 year old girl who was reportedly suffering from measles has died at a private hospital in Mangaluru on December 7, Monday. The deceased Madhushree was the daughter of Devadas and Savitri couple from Kamaje, in B Mooda village of Bantwal taluk. She was a II PUC Commerce student of Mount Carmel PU College of Modankaup. It is learnt that Madhushree who had developed tiny blisters on her body nearly three months ago was initially treated by a local doctor. However, the blisters which were cured had reappeared all over her body recently following which she was admitted to a private hospital in Mangaluru. She was then shifted to another hospital last Saturday but breathed her last within two days as she failed to respond to treatment. The doctors who treated the girl however said medical tests could not confirm if she was suffering from small pox. Madhushree has left behind her parents and sister. Was she immunized against measles ? Why were they so careless when she had the problem three months ago. In the villages the there is lack of good medical practitioner’s. The Health Minister have to concentrate on these matters very seriously. Medical negligence is the reason for Madhushree’s death. The doctor’s did not diagnose properly. Condolence to her family.RIP. Some commit suicide but poor thing the girl struggled for life but died . How sad? The lost her life due to the carelessness of the doctors and the family too is responsible. Science is so advanced but think she was treated lately.